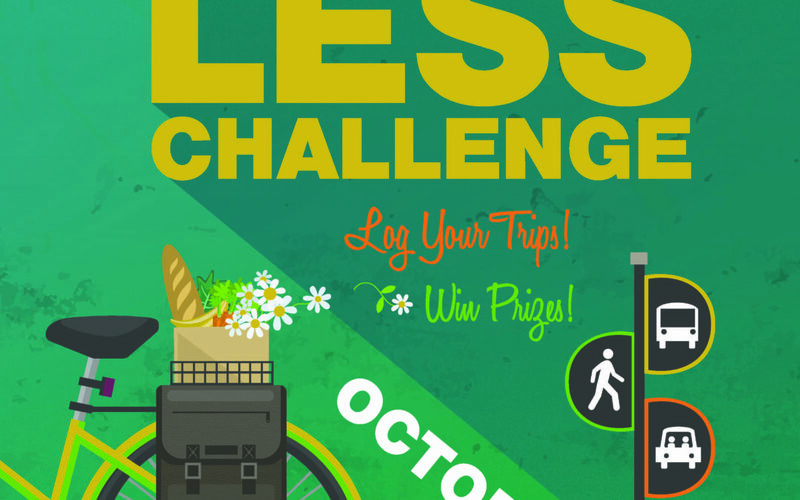 The Oregon Drive Less Challenge Coming Soon: October 1 – 15. Oregon’s annual Drive Less Challenge is back this year from October 1 – 15. Burn calories instead of gas by biking to work or divide the ride and the cost by carpooling. Take the bus and let someone else do the driving so you can relax, listen to a podcast, or read that page-turning suspense thriller. Get quality time with your family by walking to the store. There are so many ways you can get around without driving by yourself! When we all act together, we can make a huge positive impact. Last year, Oregonians in central and eastern Oregon logged 172,121 non-drive-alone miles over the 14-day challenge. Through this, we collectively prevented 118,667 pounds of carbon dioxide from entering the atmosphere, and saved 5,881 gallons of gasoline and $44,794 in gasoline costs. Step 1: Sign up online and start logging trips. You can join the Challenge any time before the last day of the Challenge, October 15 at www.drivelessconnect.com. Then, take the bus, carpool, vanpool, bike, walk and/or telework and log your trips on the website. Any trip counts for all days, including weekends – for work, school, errands or play. The more trips you log, the better your chances of winning fabulous prizes. Step 2: Challenge yourself, your coworkers or your family. Challenge yourself and your family to find creative ways to get around town without driving alone. Create a fun (or fierce) competition at your workplace to encourage and incentivize staff to walk, bike, carpool, or ride the bus. High-five your neighbor who dusted off his bike so he can ride to work. Smile at the bus driver when you get on the bus and give a thumbs-up to fellow riders. And be sure to give yourself a little reward by taking the challenge – you deserve that extra happy hour IPA for walking to work! Step 3: Win awesome daily and grand prizes. This year’s grand prizes include one $1,000 gift card to Bike Friday and three $500 cash cards. Throughout the challenge, you’ll have the opportunity to win daily prizes such as prizes and gift cards from Airbnb, Black Star Bags, Columbia Sportswear, Hydro Flask, Dutch Bros Coffee, Dakine and TREW Gear. Additionally, local central Oregon businesses are providing sweet local prizes such as gift cards from Ruffwear, Strictly Organic Coffee, The Gear Fix, Cascade Financial Strategies, and Cascades East Transit. “This statewide signature event is fun, rewarding and motivating for everyone. Even opting for one or two days to walk, bike, carpool, or ride the bus instead of driving can make a big difference in our community, and you might find you enjoy the time you spend not driving,” said Jeff Monson, Executive Director for Commute Options. Join this year’s challenge to discover what more you can get by driving less by visiting www.drivelessconnect.com. Need information, help, or resources on how to drive less? Contact Commute Options at kim@commuteoptions.org. We can help!